Palace Shower-Tight wet room tanking paste kit. This is the best quality tanking paste on the market. 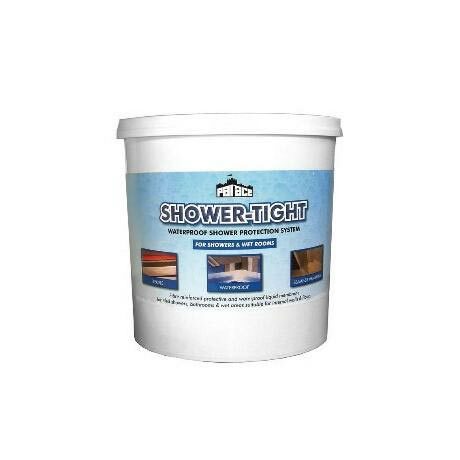 SHOWER-TIGHT is a waterproof barrier system to protect sensitive substrates in tiled areas such as showers, bathrooms, wet-rooms and kitchen utility areas. The system consists of a surface primer, a grey flexible waterproof coating and a super strong polyester matting to reinforce seams in joints around wall floor junctions. This seamless, protective membrane inhibits the passage of moisture from within the tiled area through to surfaces and structures which may be sensitive to the effects of prolonged water migration. Waterproof shower protection system for showers and wetrooms. Does what it say on the tin! I was asked to find this by the guy who was fitting my bathroom out and it was defo cheaper to buy it from victorian plumbing than on the high street. great thank you !